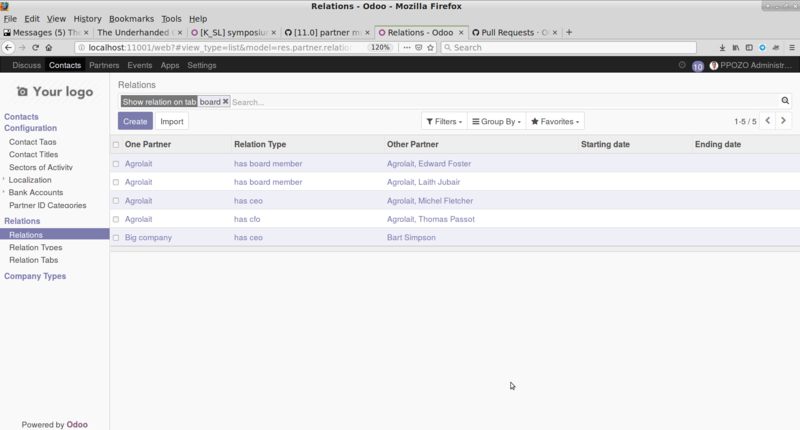 This module adds the possibility to show certain partner relations in a tab on the partner form, in addition to in the list of all relations. This can be useful if certain relation types are regularly used and should be overseeable at a glace. For instance you can make a tab named 'board' that will show all the board members of a company, by showing the relations of types ceo, cto, cfo and board member. 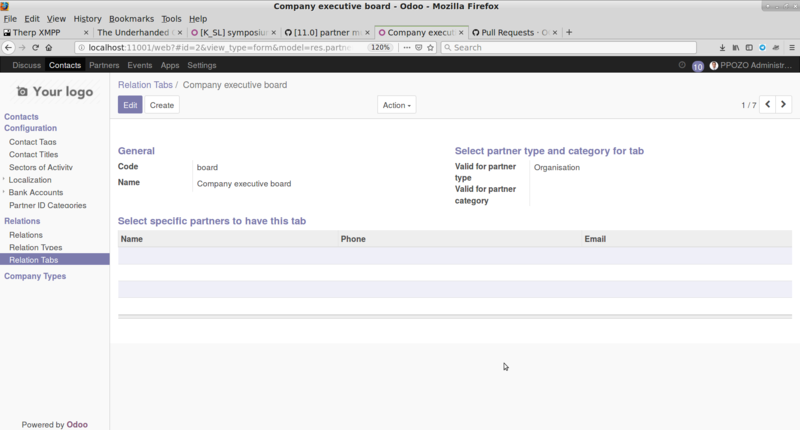 Before being able to show certain types of relations on a tab in the partner form, you will have to define the tab. Do that in Contacts / Relations / Relation Tabs. If you specify nothing, the tab will be shown on all partner forms that have tabs (page elements). 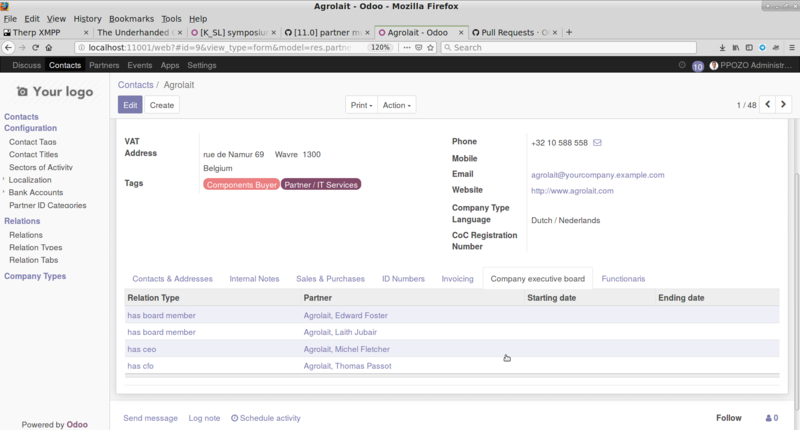 Normally you will select to show the tab only on partners that are companies/organisations, or only for persons. You can also select a category to further limit for which partners the tab wil be shown. The possibility exists to show a tab only on specific partners. For instance on your own company partner. In configuring the relation types, you can select which type of relation will be shown on which tab. It is possible to show multiple types on one tab. Do that in Contacts / Relations / Relation Types. For example on a 'executive board' tab, you might want to show the CEO of a company, but also the CFO, the CTO and normal board members. You might specify a tab for both the 'left side' of a relation, as for the 'right side' or inverse relation. 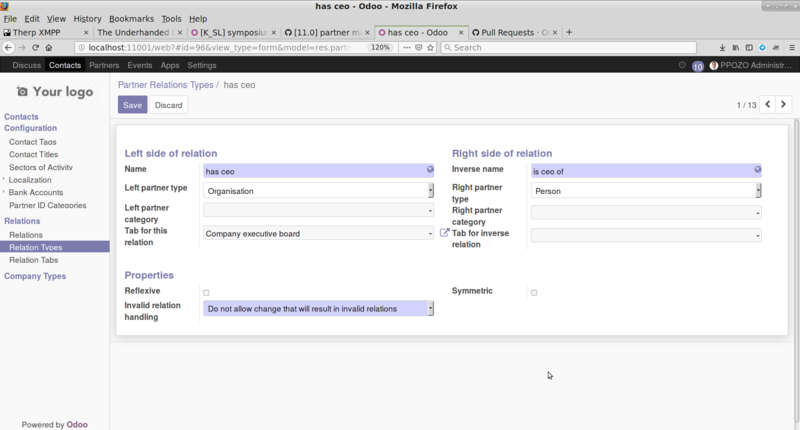 So a relation 'company has ceo', with inverse type 'person is ceo of' might specify the 'board' tab for the company type of the relation, but possibly a 'positions held' tab for the person side of the relation, so on the partner form of a person you see in one tab all positions or functions a person has, regardless in which company or organisation. For each side of a relation, the partner contact type and the partner category must be consistent with those specified for the tab. 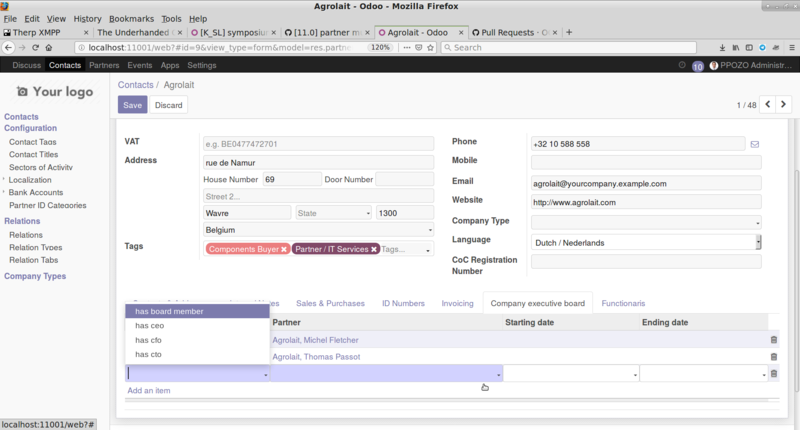 The partner form will contain extra tab pages, for each tab that is appropiate for that partner. So a company partner does not show the tabs that are meant for persons and vice versa. Also tabs meant for partners with a certain category/label will only show if partners have that label. When adding relations on a tab, only relation types appropiate for that tab can be selected. When a tab is deleted, this will in no way effect the existing relations. However the references on the relation types to the deleted tabs will also be cleared. You can search relations with the tab on which they are shown. For instance to find all board members. Do that in Contacts / Relations / Relations.